South Carolina United FC is the Palmetto State’s largest youth soccer club and aims to make a positive impact on the lives of the 4,400 children and young adults active in its programs. 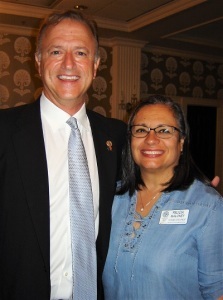 That’s what Capital Rotary members heard when Ron Tryon (shown with Rotarian Felicia Maloney) was their Oct. 17 guest speaker. Tryon – a former attorney – has been CEO of the soccer non-profit since January 2014. His goal is to offer quality youth recreational soccer in all neighborhoods and to any child regardless of race, religion or socio-economic background. South Carolina United FC attracts players from 250 schools in 17 counties and last year had 43 of its “alumni” players bound for competition at the college level. Three of the club’s former players are now in the professional ranks. South Carolina United FC’s cultural exchange program with a “sister state” in Germany has involved over 600 student-athletes and coaches since 2003. Its two annual tournaments attract some 200,000 players, coaches and parents, resulting in a $7.6 million economic impact in the Columbia area. Tryon also detailed progress on the club’s new 24-acre, five-field soccer training complex located near the intersection of I-20 and Monticello Road.